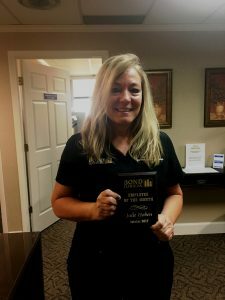 Employee of the Month - October 2017 - Bond Clinic, P.A. Bond Clinic, P.A. Congratulations to Julie Hoben for being selected as the October 2017 Employee of the Month! Julie works as a Credentialed Medical Assistant for our Hospitalist Team. She began her employment at Bond Clinic in May of 2006.